David Keilin FRS (21 March 1887 – 27 February 1963) was an entomologist, among other things. His family returned to Warsaw early in his youth. He did not attend school until age ten due to ill health and asthma. Only seven years later, in 1904, he enrolled in the University of Liège. He later studied at Magdalene College, Cambridge, and became a British citizen. Keilin became research assistant to George Nuttall, first Quick Professor of Biology at the University of Cambridge, in 1915, and spent the rest of his career there, succeeding Nuttall as Quick Professor and director of the Molteno Institute in 1931. He retired in 1952. He made extensive contributions to entomology and parasitology during his career. He published thirty-nine papers between 1914 and 1923 on the reproduction of lice, the life-cycle of the horse bot-fly, the respiratory adaptations in fly larvae, and other subjects. 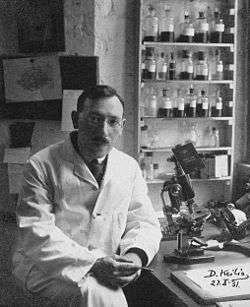 He is most known for his research and rediscovery of cytochrome in the 1920s (he invented the name). It had been discovered by C. A. MacMunn in 1884, but that discovery had been forgotten or misunderstood. Keilin was elected a Fellow of the Royal Society in 1926. He won its Royal Medal in 1939 and its Copley Medal in 1951. 1 2 3 Mann, T. (1964). "David Keilin. 1887-1963". Biographical Memoirs of Fellows of the Royal Society. 10: 183–126. doi:10.1098/rsbm.1964.0011. ↑ Hartree, E. F. (1963). "Obituary Notice: David Keilin (1887-1963)". The Biochemical Journal. 89: 1–5. doi:10.1042/bj0890001. PMC 1202263 . PMID 14097361. ↑ Ferguson, S. J. (2001). "Keilin's Cytochromes: How Bacteria Use Them, Vary Them and Make Them". Biochemical Society Transactions. 29 (6): 629–640. doi:10.1042/bst0290629. ↑ Hartree, E. F. (1973-10-01). "The discovery of cytochrome". Biochemical Education. 1 (4): 69–71. doi:10.1016/0307-4412(73)90074-5.